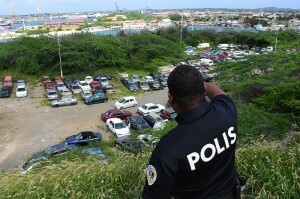 WILLEMSTAD - There were cars stolen again from the Kurá di Raspa, the police yard for confiscated vehicles. Unknown forced the gate and took two Hyundai I-10 cars. Earlier there were reports that the police yard is a ‘free for all’. The police no longer guard the site in Batavierenwijk and the security company that has been hired by the police has not been paid for months. At that time, three arrests were made fairly quickly, but the surveillance regime was not adjusted.